I am sad that I can only show you a heavily cropped image of this majestic bird, but it’s better than not to show a photo of the bird at all. 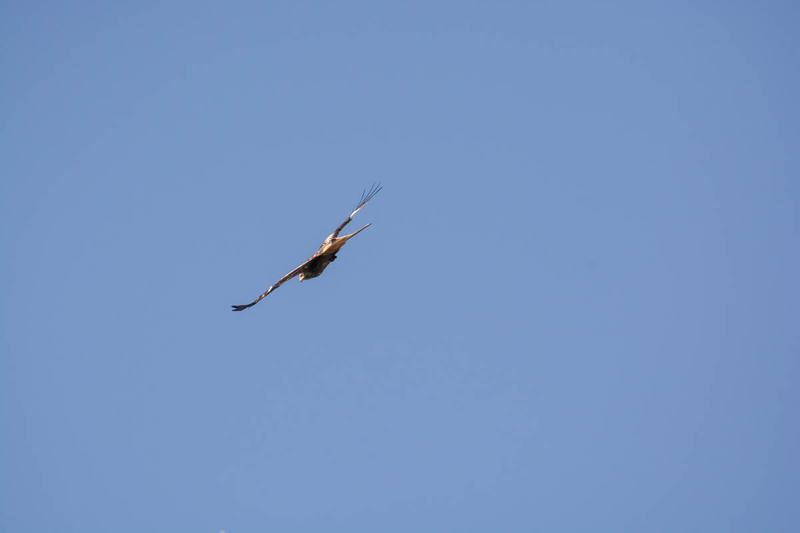 At the beginning of the year when I was still in Reinfeld, I spotted a red kite (Milvus milvus) in the air after hearing the very noticeable and beautiful sounding call. I remember that I was so amazed that I pointed my camera in the air when it was already too late. Since I’ve been in the town for over a half year, I hiked so much through the nature around the town that there was at some point no new area to discover anymore. 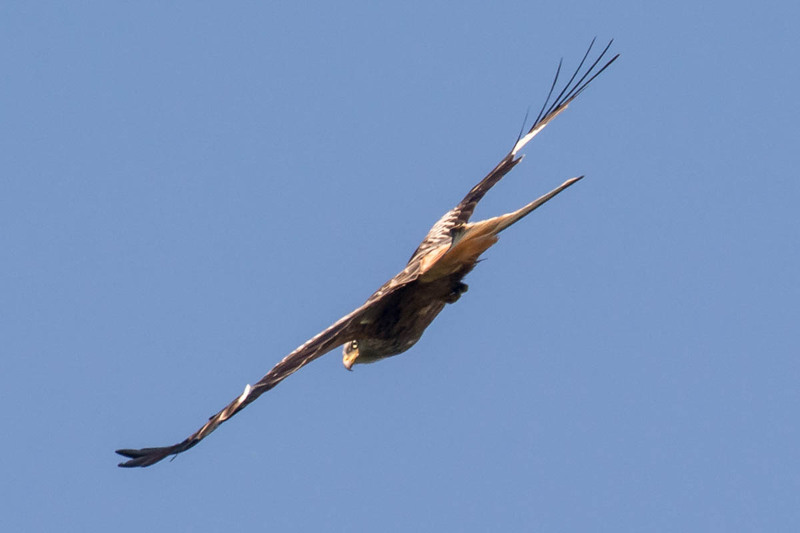 At this point I started to hike my most favorite routes, including the route where I spotted the red kite the first time. I was surprised, yet again I heard the beautiful calling and spotted the majestic bird in the air again. But this time my brain switched to the photographers mode and I could take a photo. The problem is however, and I complain about this everytime, that my 300mm lens (effectively seen a 450mm lens on the D7100) is simply not long enough for bird photography. While the lens is really good for birds in the park, it’s more difficult if we talk about birds that are further in the distance outside in the nature. But I couldn’t accept that the shots were for nothing, I tried how far I can go with cropping and you see the result in this post. I must say that the focus was spot on in the original image, and I was surprised that I could crop the image without mercy. In most cases the result would be a mess, which means a too heavy crop would make the photo useless. But in this case the result was rather decent, not of hight quality of course, but with a bit of editing it was not a pixel mess. I decided to show you the heavily cropped image, because you can clearly see the bird, and I am happy about this. To tell you what I mean by cropping without mercy, the original image had a resolution of 6000 x 4000 pixels (24 MP) and the exported image after cropping had a resolution of 1801 x 1201 pixels (2 MP). With that said, the cropped area is 9% of the raw image. I moved the noise reduction slider one third but added much of sharpness with the masking slider in Lightroom. I added quite a lot of clarity, because it just looked better with it, and apart from that I only changed the colour levels a bit. I do a lot of cropping. It’s a great picture. That is right. If it still looks good after the crop it is fine. I do know what you mean though. A good telephoto lens is better than a crop. You can see his eye and the hook of the beak in your cropped photo so I think it was definitely worth it. I was surprised that it wasn’t a blurry mess with this heavy crop. I guess I really had luck that the focus was perfectly on the bird. I think it’s a nice shot! 👍 You did well with what you have. I have difficulty photographing birds in the wild. I’m always excited when I’m able to get 1 nice pic out of so many that I take. Cropping is always a must for me.